3 Chimney Problems That You'll Want to Avoid! | 2nd Generation Chimneys, Inc.
3 Chimney Problems That You’ll Want to Avoid! People think of fireplaces and chimneys as being simple. They may not feature some of the modern technology that today’s most advanced HVAC systems boast, but that doesn’t mean the fireplaces and chimneys are as straightforward as you think. It’s not just a hole in a wall with a pipe on top to let the smoke out, after all! There is a lot more to fireplace and chimney installation and design than may meet the eye—and a lot that escapes your eye. Today we’ll look at 3 potential problems that you may encounter with your chimney. Are these meant to scare you off of using your fireplace, or having a new one installed? No, of course not. After all, any heating system has the potential for a dangerous situation to develop. We just want to remind you of how important it is to work with Minneapolis, MN chimney and fireplace professionals. In other words, we want you to work with us! You may not be too concerned with how clean your chimney is. It’s not as though you’ll be hosting a party in there, right? Obviously not, but that doesn’t mean that you don’t need your chimney cleaned out regularly. Creosote builds up over time, and it can create a very dangerous situation if you allow it to. Creosote is that sticky, tar-like substance that builds up in the chimney, and if you’re burning wood, you’re generating creosote. There is no getting around it. Creosote can build up to the point that it creates a real fire hazard in your chimney. If you want to use your fireplace safely, then you need to have that creosote cleaned out of your chimney! You don’t want water to flood into your basement, right? Well, you don’t want it dripping into your fireplace, either. In each case, serious damage can be done. Not only will water dripping into the fireplace potentially splash down into the hearth, but it can also lead to masonry damages. This is especially true when temperatures are cold enough to freeze that water up in your chimney. As you surely know, water expands when it freezes. If there is water in cracks in your chimney, and it then freezes, it can split the masonry and cause the chimney’s integrity to crumble—literally! 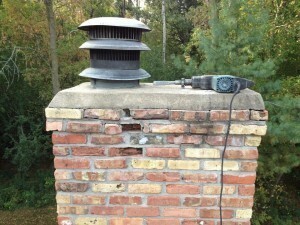 Make sure that you have a good chimney cap in place and that you let us waterproof your chimney. Do you see smoke puffing out of the side of your chimney? Is it drafting down into your living space? That’s obviously not a good sign! You have structural damage, and you need prompt and professional repairs! There are a lot of reasons why you may encounter masonry damages, from the chimney settling over time to extreme weather and even poor past services (not when you work with us, of course). You need to have any such problems resolved ASAP if you’re serious about getting your chimney right back on track. Schedule your chimney cleaning and repair services with 2nd Generation Chimneys, Inc.